Health insurance premiums for the nearly 150 million people who get family health insurance through employers rose an "extraordinarily modest" 3 percent in 2014, a new report released Wednesday shows. The increase in premium prices barely outpaced average increases in workers' wages and general inflation, which were 2.3 percent and 2 percent, respectively, noted the survey released by the Kaiser Family Foundation and the Health Research & Educational Trust. But that report also underscored the now-strong trend of employees' shouldering a bigger share of total premium costs, and being on the hook for more out-of-pocket medical costs than they were a decade ago. Premiums for a plan that cover an employee and their family now average $16,834 annually, with employers footing around 70 percent of that bill on average, according to the survey. Workers thus were forking out an average of $4,823 each year for their share of their family plan's premium. 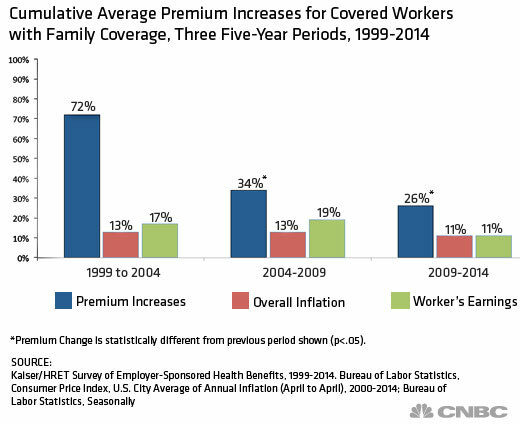 Premiums for just an employee, which grew an average of 2 percent over last year, now average $6,025 annually. Employers picking up a bigger share of that total cost—82 percent—with workers themselves paying the balance, or $1,081 on average, according to the report, which looked at data from 2,000 small and large employees. The increase in premiums for family plans has grown a total of 26 percent in the past five years, slower than the total 34 percent growth seen in the five years before that. Kaiser noted that the 10-year trend is "well-below the annual double-digit increases recorded in the late 1990s and early 2000s." Kaiser Family Foundation President and CEO Drew Altman, who called this year's increase in premiums "extraordinarily modest," said, "It means the pain level for rising premiums is little bit lower than in the past, as least in this year." Altman said the slow growth is a result of both the overall economy, which has sluggishly recovered from the 2008 financial meltdown, and changes in the health-care system in recent years that were made to tamp down the previously sharp increases in medical costs. Altman said of the overall report, "The relatively slow growth in premiums this year is good news for employers and workers, though many workers now pay more when they get sick as deductibles continue to rise and skin-in-the-game insurance gradually becomes the norm." 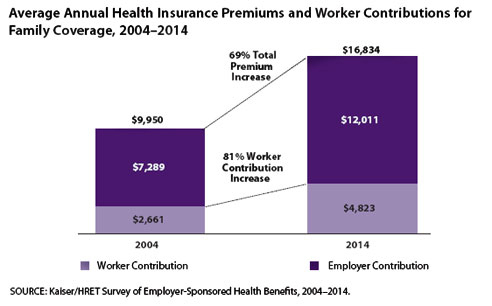 While the growth in total costs of premiums, and their share paid by employees themselves, has grown more slowly in the past five years than in the prior five years, workers today now are paying a significant bigger share of total premiums as well as incurring higher out-of-pocket costs on top of that than they were in 2004. Since 2004, total premiums for family coverage on an average employer's health plan have risen 69 percent, from $9,950 to the current $16,834. But a worker's contribution to that total premium has grown an average of 81 percent, rising from $2,661 then to $4,823 now. 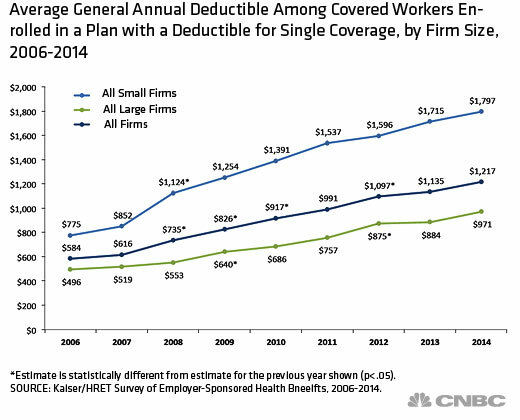 And the average deductible for such a plan is $1,217, a 47 percent increase over the average deductible of $826 in 2004. Deductibles are the money that covered people must pay before most of their health services are paid for by the health plan itself. There's also more people who are subject to deductibles of at least $1,000 in their plans. "Today, four in 10 covered workers face at least a $1,000 deductible, nearly double the share from just five years ago," said Gary Claxton, a Kaiser vice president and lead author of the study. The full study can be read here: 2014 Employee Health Benefits Survey.